Now that you are processing your email instead of nesting on it, you’ll need to consider a sustainable strategy for archiving and storage of your message. You also need to figure out how you’ll find what you need (a common source of anxiety for those of us who are unaccustomed to filing). File everything you think you might need. Don’t be concerned about hanging on to something, as long as you have a good place to put it where you can get to it if you need it. Disk space is more abundant than ever these days, and there are plenty of free, readily-available searching and indexing tools to help with retrieval (more about that later). I know I said you can file anything you want, but try to develop a more mercenary attitude about what you file. Your tolerance for this, your personal document retention requirements, etc. may vary, but anything you delete is something you no longer have to take care of. You won’t always remember what you called the file, but you should be able to find it in a couple of tries (for example, info about General Motors will be under Inbox/Customers/General Motors or Inbox/Customers/GM in my system. This will help you find things, and will help you purge things systematically. For example, you may want to archive old, complete projects, things from a previous role in the company, and what not. This way, when I search for “corporate presentation” I can easily find the latest one. This method allows me to find all files that start with “2005” so I can easily archive them to off-line storage and get them off my system when the appropriate time as passed. In corporate environments, there is typically a limit to how much data you’re allowed to store on your company’s mail server. That’s certainly true for me. To make it easy for me to find things, I did the following (note that this is Outlook-specific, but similar concepts should apply with other email systems). One of the issues I’ve had with Outlook is that it doesn’t put its archive files in the My Documents folder by default. When I do system backups, I’d like to be able to back up My Documents and get as much of my user-specific data as possible, so I create an archive file that is stored within a “My Documents\Outlook Offline” folder. To create a new archive folder, use the File / New / Outlook Data File… command within Outlook, and navigate to a folder within your “My Documents” folder on your PC. My current Archive folder is called “1ArchiveForGTD” but you can name it anything you want. Next, from within Outlook, select Tools / Options, then click on the “Other” tab. On the “Other” tab, click the AutoArchive button, and you’ll see something like the dialog below. 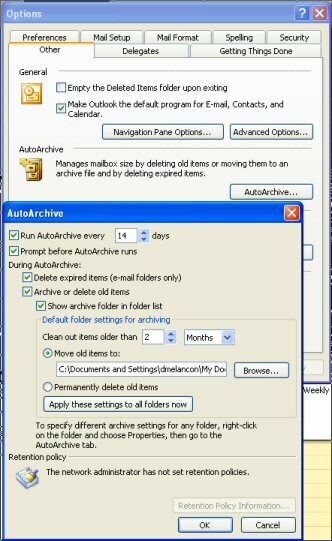 As you may be able to see, I have changed my default AutoArchive settings so that my old messages are moved to this Archive file every 14 days, and I move items over 2 months old. This creates a replica of my folder structure within the Archive folder so I can easily find items that have been archived. So how do I find items? I use a program called LookOut to index and search all of my mail folders, and have scheduled re-indexes daily so LookOut’s data stays current. Similarly, you can use one of the many free desktop search products available now from Microsoft, Google, Yahoo!, and others. I don’t autoarchive my tasks or contacts – you can use the same approach to exclude them from the autoarchive process. This is a very high level overview of my process – I’ll share some other tips in the future that may help with these actions, as well.